“One of them, when he saw he was healed, came back, praising God in a loud voice. He threw himself at Jesus’ feet and thanked Him—and he was a Samaritan. Jesus asked, ‘Were not all ten cleansed? Where are the other nine? Was no one found to return and give praise to God except this foreigner? '” (Luke 17:15-18 ). “Neither were they thankful” (Romans 1:21).”But know this, that in the last days perilous times will come: For men will be lovers of themselves, lovers of money, boasters, proud, blasphemers, disobedient to parents, unthankful, unholy, unloving, unforgiving, slanderers, without self-control, brutal, despisers of good, traitors, headstrong, haughty, lovers of pleasure rather than lovers of God, having a form of godliness but denying its power. And from such people turn away!” (2 Timothy 3:1-5). Earlier this year we drove through a small town in northern Maryland we often hear mentioned on our local Christian radio station called “Rising Sun”. It’s a pleasant sounding name for a town, sort of like Mount Joy! But as we drove toward Rising Sun we passed a road named “Thankless Lane”. Now that’s a most unusual name for a road. How did they ever come up with such a negative name? Was there a grumpy old farmer that one time lived on this lane who had a reputation for being unthankful? Perhaps a good deed was done for someone and the kindness was spurned by ingratitude. Brooksyne and I have determined that this is a road we wouldn’t want to live on either literally or spiritually. We consider people who by their outlook in life seem to live on Thankless Lane. Unthankfulness is one of the most dominant and universal sins in the human race. We see plenty of evidence of that all around us don’t we? Let us consider the peril of unthankfulness. Warren Wiersbe tells a story about a ministerial student in Evanston, Illinois, who was part of a life-saving squad. In 1860, a ship went aground on the shore of Lake Michigan near Evanston, and Edward Spencer waded again and again into the frigid waters to rescue 17 passengers. In the process, his health was permanently damaged. Some years later at his funeral, it was noted that not one of the people he rescued ever thanked him. Jesus often asked questions to get his hearers to think, although He obviously knew the answer. In today’s first Scripture text (Luke 17:11-19) He had healed ten lepers but only one returned to say, “Thank you”. I’ve wondered what excuses the other nine might have had in failing to return to give Jesus thanks. I came up with nine possible excuses they might have used and list them below following the message. Notice they are all pertinent to today! Thankfulness is an excellent testimony. Others observed this and the story became part of the Scriptural record. Will we be like the one who returned to give “Thanks” or like the nine who did not? Daily prayer: Father, each of us make our dwelling on Thankful Lane when we daily attribute thanksgiving to You who provides for all our needs. You give us shelter from the harsh elements, food on our tables, clothing for our bodies and people who love and care for us. We’ve been blessed beyond measure, both physically and spiritually as You provided for our greatest need; salvation. We will eternally praise You for Your goodness to us. Amen. Thankless Lane near Rising Sun, Maryland is here. 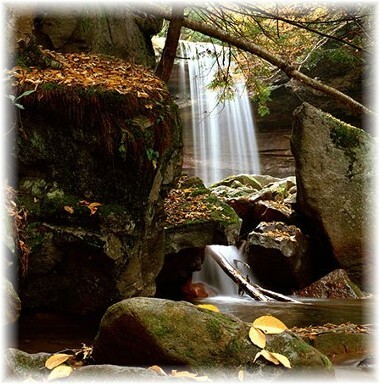 Today’s photo of Cucumber Falls in the mountains of western PA was taken by our friend Howard Blichfeldt. 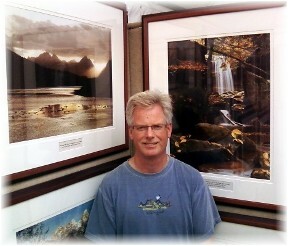 He is a professional photographer with outstanding nature photos along with correlating Scripture passages. Here’s a portion of his mission statement: “A greater reward comes from knowing that my experience and love of nature has drawn me closer to the God who created it. If through my artwork I can aid others in accomplishing the same, then in some small way, maybe I will have made a difference.” (I use his photos with his permission). 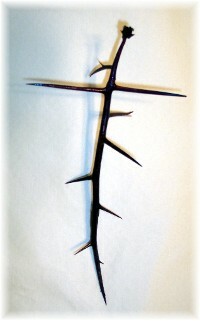 “Thankful For The Thorns”: A family reading and exercise that is a wonderful way to give a thoughtful focus around your Thanksgiving Table (printable webpage) The Thanksgiving celebration includes family coming together along with the turkey and trimmings. Often there’s a lot of food with little meaningful conversation. Why not add some stimulating discussion about the ways God has worked in your life over the past year! Some of you are not in charge and are only visitors at your Thanksgiving gathering, but if it is possible share together around the table the theme of “Thankful for the Thorns” or the questionnaire we’ve provided in this link “A Thanksgiving family exercise” (pdf). We have used this questionnaire as a stimulus for discussion among family members in the past in our home. We encourage you to share results around the table at Thanksgiving before or after the meal. A Thanksgiving prayer: (written by Joe Sherer, a pastor friend of ours and shared as the benediction at our community Thanksgiving Eve service several years ago.) Webpage For those who enjoy written prayers this would be a beautiful prayer to read together at the Thanksgiving table. A Day of Rest in Plimouth Colony: This is a summary of a chapter in the lives of the pilgrims that Brooksyne uses to teach about their Sunday worship. (pdf) Note: Although we spell it Plymouth today the old spelling was Plimouth. “Hymns of Hope” Brooksyne has compiled eleven hymns that deal with the recurring theme of loss and ongoing trial and titled it “Hymns of Hope” based on Romans 12:12, “Be joyful in hope, patient in affliction, and faithful in prayer.” Amber Martin plays the hymns on the keyboard and Lauren Gingrich accompanies her on six of the hymns with the viola. Tracks 12-22 play each hymn softly in the background while Brooksyne shares a personal devotional thought, the biographical setting of the hymn text, and an intercessory prayer. We recorded this in the very modest and limited computerized recording studio of Daily Encouragement so that we could make this ministry project available to all who are in need of such encouragement. Thus we realize the audio quality is not what most are accustomed to. You can go to this site to listen to the songs. You can download one song at a time if you find this to be of special blessing or know someone whose spirit might be lifted by listening to these meditative hymns. 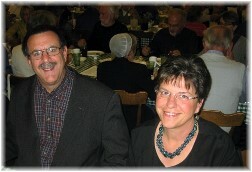 “ThanksLiving” Bob Southard, a friend of ours shares a weekly online sermon. Here’s a pdf version of his thanksgiving sermon.